Children are instinctive drummers. They like to be in the present. Unlike other instruments where the child has to practise a few months in order to play a song, drumming is in the present and instantaneous. The majority of world-class drummers has been exposed to drumming at an early age. Our Junior Classes are extremely beneficial for children from the age of 7. Our course is designed to bring fun and fundamentals to our students, educating them how to count beats, understand rhythm, keep time and get tuned in to playing basic drum beats. Through time, the child develops coordination and timing through a series of interactive exercises that will keep him or her involved and actively participating by playing along with the lesson. Course Fees (Pro-rated) for the current month. * Course Fees Per Month. Group Classes Not Available for Junior Programme. In a month with “5 weeks” (e.g, 5 Mondays in a month), the 5th week is a bonus lesson for the student. We generally do not advise parents to purchase a drum set until the child is able to control and develop proper sticking techniques. 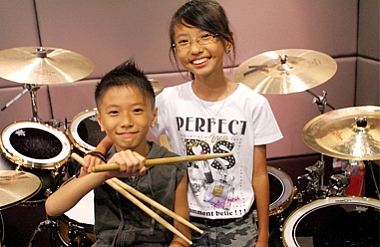 Hian Ming, 11 years old, loves playing the drums everyday. He is one of the rare talents that we have at My Drum School, getting his inspiration from Akira Jimbo (Japan). Here, he demonstrates a difficult technique using some massive Double Bass drumming! We could not help but to include another camera angle just to capture his double bass! Here is a second video promo about the kids we have at MDS. What if you had a chance to interview the children and ask them difficult questions? How much are your drum fees in a year? Why do we need drum teachers? Why do you like drumming? I’m sure we would love to hear their responses! That’s what we did. Here’s our 2010 Educators’ Day Video, featuring the young ones at My Drum School.